Signed and dated on the left bottom corner by the maker, this is the third part of four framed works on paper which document the two wedding dresses which were selected and deconstructed to make Wedding Cage. 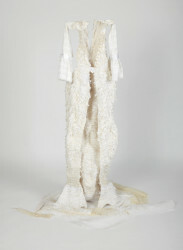 As a group, these Cast-offs make reference to frames of motion picture, as the dresses float, divide and become one. Initially the two wedding dresses were laid out flat and photographed in different positions. These photographs were then photocopied. 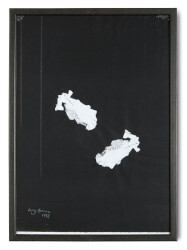 In turn these black and white photo- photocopies were then cut and collaged to make ‘Wedding Cages’ and 'Cast offs’. Hands, scissors and spatula are used in making. 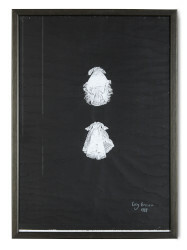 Wedding Cages' Cast-offs (in four parts) - 3 of 4, Lucy Brown, 1998, Crafts Council Collection: AM456. Photo: Stokes Photo Ltd. 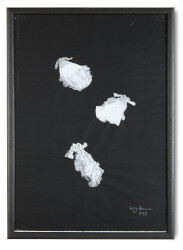 Wedding Cages' Cast-offs (in four parts), Lucy Brown, 1998, Crafts Council Collection: AM454, AM455, AM456, AM457. Photo: Stokes Photo Ltd. Wedding Cages’ Cast-offs are significant to my early career work. 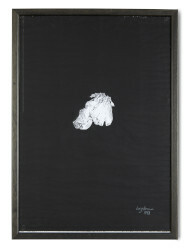 These four drawing collages initiated the on-going black and white photographic style series of ‘Cast-offs', which were created from 1998 up until 2005. ‘Cast-offs’ are the cast away/dismissed/got rid of other women’s clothes which I gather up and collect for raw materials in my work. Cast-offs are an early method of documenting my selection and thinking processes at the time. I first began to photocopy part of the Wedding Dresses I was considering to use, unsatisfied that I could only a small part on the garment on top of a photocopy I started to experiment with ways of photographing the wedding dresses and other clothes at the time, that I was thinking of using in my work. I have always seen the individual collages as frames from a film reel and would like to develop a short animation with these works.